The dynamic and dramatic nature of the American Civil War was illustrated by companies like Currier & Ives, which specialized in fine art lithography. America's Civil War chronicle from 1861 to 1865 is intriguing because it represented a precipice of change for the United States. The Industrial Revolution was in full swing in the North with developed textile mills, shipping, coal, iron and oil industries; whereas, the South was agriculturally orientated, focused on cash crops like cotton, sugar, and tobacco. Since the invention of the cotton gin, the South had become even more dependent of a labor pool of more than 4 million enslaved African Americans. Slavery was interwoven throughout, sometimes being of primary importance and other times secondary. Other issues, like states' rights and human compassion, helped to further spark the American Civil War! The relatively young nation found itself at a crossroad. The road behind had unresolved issues from the American Revolution era, and the road ahead was uncertain, roughly paved with division and polarization. The northern and southern states gradually slid towards war having become economically, politically, socially and morally divided. Coming into the election of 1860, the Democratic Party was divided on its platform. One group within the Party, consisting mostly of southerners, took a strong pro-slavery position and demanded federal protection for slavery in the western Territories, as well as other measures favorable to the southern minority in the Federal government. The other group consisted mostly of northerners and took the position that "popular sovereignty" should decide the slavery question in the western Territories. Popular sovereignty was a philosophical concept previously applied by different senators by which controversial issues, such as slavery, would be decided by the popular vote of a given state or territory. Internal strife in the Democratic Party almost guaranteed that the Republican Party candidate, Abraham Lincoln, would be elected. The Republican Party was relatively new, having been founded in 1854. Lincoln was elected president in November 1860. Lincoln was not an abolitionist, but he opposed the further spread of slavery. He did not start out to abolish slavery. Though Lincoln said that he was not going to end slavery where it existed, the Southern states were not satisfied or pleased with that position. The United States had gained more territory in the west from earlier events: the Mexican War and the Louisiana Purchase. Westward expansion had opened up new land and new states. Wealthy southerners wanted to expand their landholdings, which required more slaves for cotton production. Also, the Southern states felt squeezed economically and politically; they believed their way of life was being depressed and regulated. They also felt legislation, like the tariffs, were unjust and favored the North. Lincoln said that the U. S. Constitution did not legally allow states the right to secede, and he would use force to retain Federal installations where they existed in the South. In his mind (and strategy), the protection of government property was not technically an invasion. His election though solidified the different factions' beliefs and almost immediately instigated secession action. In November 1860, Lincoln was elected. South Carolina seceded in December followed by Alabama, Mississippi, Florida, Louisiana, Georgia and Texas a few weeks later. 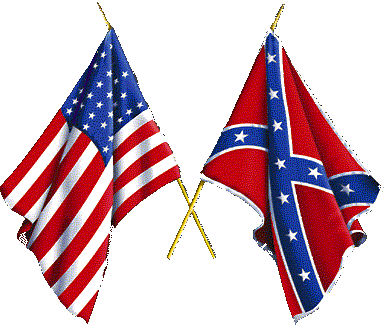 In early February 1861 delegates from states wanting to secede met; formed the Confederates States of America; and drew up their constitution. Lincoln was inaugurated March 4th. In April, Virginia seceded. The first shot of the American Civil War occurred at 4:40 a.m. on April 12th on the Federal installation of Fort Sumter, Charleston, South Carolina, which guarded the harbor. 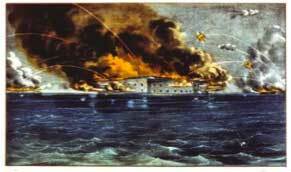 The attack on Ft. Sumter, the first of many Civil War Battles, coalesced many people in the North into a defensive posture. With the South seen as the aggressor, a benefit to Lincoln, he then issued a Proclamation, April 14th, requesting for volunteers to "repossess the forts, places and property" taken from the Union. Later in the year, Tennessee, Arkansas and North Carolina seceded. Thinking that the war was fought entirely in the eastern part of the United States is an easy mistake. War fronts were also created in the west and on the sea as well. Because of the expanse of the war, developments surrounding the wartime effort propelled the United States onto a future path of technological and economical change. The American Civil War's legacy is characterized in these pages as a web of people, places and actions, which was initiated in this time frame and influenced future events in American history. 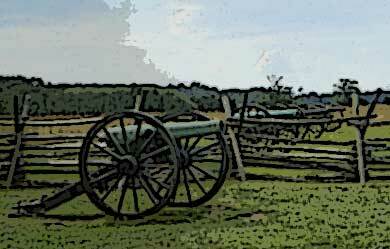 Only in retrospect is the ripple effect of Civil War events apparent; those effects, which spanned decades, even generations, reached into the 20th century and to present day and making changes to all aspects of American culture.The FAST FORWARD logo will propel visitors to site pages describing future related legacies. If you are a student researching the Civil War, collector, reenactor, history buff or lay historian the information here—text, photographs, videos, and links—may be appealing and beneficial, particularly during the sesquicentennial time frame of the Civil War. Stories of army and civilian personalities, businesses and technology, espionage, the Underground Railroad and more can be found on these pages, which try to reflect the National Social Studies Standards. Please enjoy this site and return to learn more history as its developments take shape. Pass the URL to friends and acquaintances who might be interested in aspects of American history and link. Thank you for your visit.